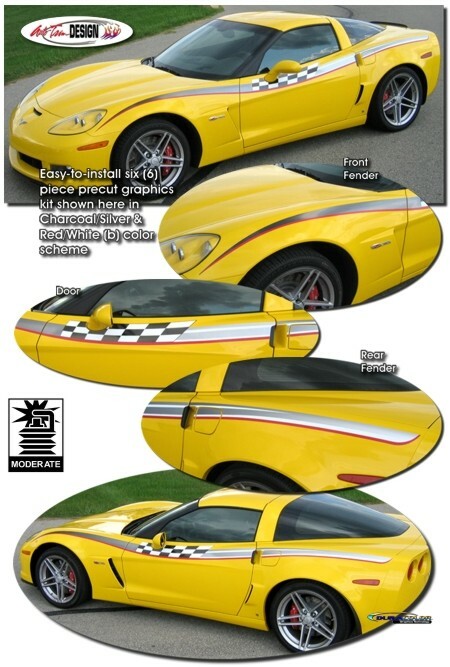 Set yourself apart from the rest with this "Racy" graphic that follows the unique lines of your Chevrolet C6 Corvette. Inspired by graphics used on the team of C5 Corvettes in the world famous Bondurant School of High Performance Driving, this easy-to-install seven (7) piece graphics kit is precut and ready to install - NO TRIMMING required! Packaged with one (1) graphic set for each side of the vehicle and is available in two (2) color schemes. To view Color Scheme choices, please 'click' here. This graphic is specifically fit for '05-Current Chevrolet C6 Corvettes (Coupe, Convertible & Z06) and will not fit any other vehicle.